Cutting men's hair is exciting! There is a high demand among American males who want cutting edge looks. There are always new styles and it can be both a creative and a fun career. 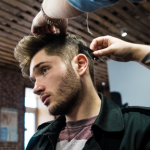 By learning the latest looks and familiar classics, you can develop the John Amico barbering skills and start your next career. 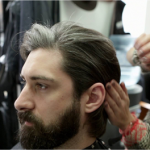 John Amico certifies his men's haircutting system. You will connect with experts who teach you how to work with the male clientele. There are John Amico Graduates who exclusively work on men. The John Amico School of Hair Design has endeavored to produce quality cosmetologists who can meet the present and future demands of the beauty industry. On such need is Men’s Barbering & Hair Styling. The John Amico School of Hair Design is student-focused and committed to providing each student the knowledge, training, and confidence needed to succeed in the cosmetology profession. Throughout their training programs, emphasis is placed upon essential salon services and techniques, business strategies such as customer service, client retention, salon retailing, target marketing and people skills. John Amico School of Hair Design prepares its students to pass their state licensure exam. We are "transforming lives through quality education", thereby equipping our students, future salon professionals, with the tools needed to become successful in their communities.